Discover the winner in you! With the Polar Vantage multi-sports watch you have a precise performance analysis to enable you to get the most out of your training - while still being stylish in design. Running Index: approx. VO2 max. Polar presents the next gerneration of wrist optical pulse reading with the professional sport watch Vantage. The brand new Polar Precision Prime Sensor Fusion technology not only has the optical pulse sensors but also a 3D acceleration sensor and skin contact sensor to minimise false readings from your movements and impacts. These false readings through the various measurement methods can almost completely be excluded from our readings. Therefore you can count on the data given is actually what you have performed. The Polar Vantage V delivers reliable data with each training - even under the most difficult circumstances. The battery life of the pulse watch Vantage V carries a proud running time of 40 hours – even with active use of the watch under training conditions! Without pulse and GPS sensors active the Vantage V can last days without re-charging. 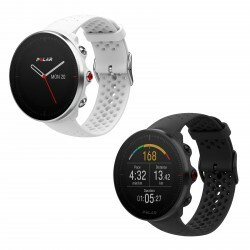 The Polar Vantage V is equipped with Bluetooth, was that you can also connect external sensors or even your smart phone so that the data can automatically be synced with the Polar Flow app. The Vantage V is the first sports watch that is able to measure your performance in Watts while training. The measurement is possible through the tempo, acceleration and ascent/descent data. The altitude measuremeant is possible through a barometer which is built into the Vantage V and thus delivers precise readings. The Watt readings are then also used to calculated the Running Power, which measures the load of what the joints and muscles carry during the training. Next to the pulse functions the Polar Vantage V also has various functions for activity tracking. It measures steps, distance, sleep quality and offers the possibility to set a daily goal to reach. The Vantage V has the tool "Training Load Pro", which gives an overview of how your training sessions have loaded the different systems in your body. Training Load Pro delivers various results: The "Cardio Load" informs how heavy the cardiovascular system was loaded during a training session. The "Muscle Load" informs how the muscles were loaded during one training. Also the "Perceived Load" plays a part in the Training Load Pro calculation, where subjective feelings be can combined with the data from the Polar Vantage V.
The tool "Recovery Pro" helps you reduce over training and minimise injuries. With help from a orthostatic test can your daily recovery recommendation be calculated. So that long-term an effective balance between training and recovery is found. The Polar H10 is then needed for this function. The Polar Vantage V has oriented its round display from the classic watch design, the watchband also closes as normal watches do. Built out of Gorilla glass, the always-on display is layered with an anti-fingerprint and anti-glare surface. The Vantage V, along with the touch display, is built with five buttons on the side of the frame with an anti-slip surface. The watchband of the Vantage V also fits thin wrists optimally and is available in Black, Orange and White with a stainless-steel frame.